Mosaic (MOS) which we sold yesterday is riding the Monsanto (MON) earnings report today - different businesses; but both in the agriculture space. Monsanto has confused me from a stock perspective - despite having one of the highest "moats" in the business (barriers to entry) it simply has not reacted with the rest of the commodity complex. Further confusing is its revenue stream should be a lot more secure than a fertilizer company... hence the weakness has been strange. Until this morning, the stock has been stuck below the 50 day moving average, and basically "asleep". I've always wanted to own this stock, but the valuation has always been immense and of late I've been waiting for the chart to improve. 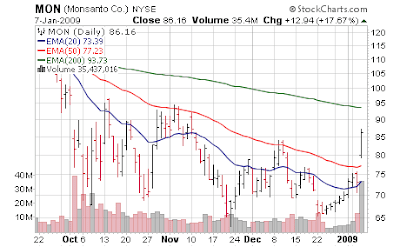 The 50 day moving average is about $76, and the stock gapped up over it - from $74 yesterday to low $80s today. My expectation is at some point, the stock will come back and "fill the gap" at $76 or so and then we'll see how it reacts. If it "bounces" we'll want to jump in... if it breaks down, then obviously the market is not ready to give this stock a longer run. Earnings were stellar...and guidance was raised (again) - this company has a history of raising guidance continuously. Monsanto Co., the world's biggest seed maker, said Wednesday its fiscal first-quarter profit more than doubled on higher sales to Latin America, and raised its expectations for the year. The St. Louis-based company said it earned $556 million, or $1 per share, in the three months ended Nov. 30. That compares with $256 million, or 46 cents per share, a year ago. Monsanto said it earned 98 cents per share excluding gains from discontinued operations. Monsanto said revenue jumped 29 percent to $2.65 billion from $2.05 billion, as sales of Roundup and other herbicides and corn seeds and traits climbed more than 30 percent each. Monsanto reported strong demand for its weed killers in Brazil, and total herbicide sales rose 35 percent to $1.36 billion. Revenue from the company's agricultural productivity unit increased 28 percent to $1.55 billion. It also made gains in sales of genetically modified seeds. Monsanto said total seeds and genomics sales were up 31 percent, to $1.1 billion. That includes a 34 percent surge in corn seed and trait sales. Growing demand from Brazil and the U.S. pushed those sales to $628 million, Monsanto said. Latin American sales make up the bulk of Monsanto's first-quarter revenue. Most of the company's revenue come from its U.S. business, where sales pick up in the second and third quarters. Soybean seed and trait sales grew 31 percent to $212 million, which Monsanto credit to demand from early growers in the U.S.
Monsanto also now expects its free cash to be slightly above $1.8 billion for fiscal 2009, underscoring the company's ability to grow yet maintain its financial discipline. Monsanto now forecasts an adjusted profit of $4.40 to $4.50 per share in fiscal 2009, up from $4.20 to $4.40 per share. The new outlook includes only results from ongoing operations, and does not include the effects of its purchase of a Brazilian sugar cane business.